Rooftop Units (RTUs) are everywhere. Over 45 percent of the commercial real estate space in the US is cooled, and/or heated by packaged units. This equipment is usually exposed to the elements, on a rooftop or outdoor space. Exposure shortens equipment life, so well cared for RTUs have a life expectancy of about 15 years. Equipment that is left to run until it fails could last only 11-12 years or less. Rooftop Units represent a very large opportunity to increase energy efficiency in commercial buildings. With every passing year this equipment is likely to become less efficient, and the average age of the installed RTU inventory is already more than 10 years old. Wear and dirt will impede the operation of mechanical functions. Dampers will fail to open or close. Refrigerant will leak reducing efficiency. The cost of moving air through air filters can double after about 18 months. Rooftop units are rated by the manufacturer with an energy efficiency ratio or EER. It is important to note that there is a large difference between theoretical and actual EER. Rooftop units are becoming more efficient. Theoretical EER ratings for high performance RTUs now can be up to 18. Actual EER of older units may be well below 6. Doubling the effective EER will reduce energy consumption by 50 percent. The following examples illustrate the potential savings from maintenance or retrofit activities. 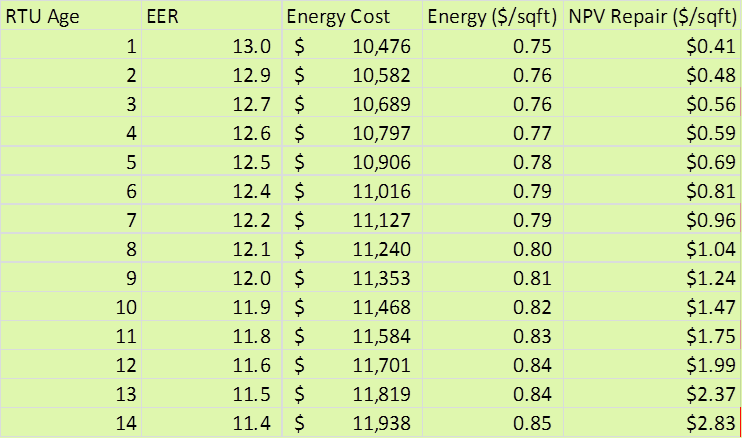 In this example, replacing a 10 year old standard RTU (red table below), now with an effective EER of 6.2, with a new high performance model (above, EER 13) would reduce annual cost from approximately $1.58 per square foot to just $0.75 per sqft, a savings of 52 percent. The net present value of the expected repair/replacement cost of the old unit is $2.41 per square foot, while the NPV of repairs for the new unit is only $0.41, reflecting the age and reliability of new equipment. The replacement cost of an RTU is approximately $1200 per ton, which equates, in this case to $3.00 per square foot. If the net replacement cost ($3.00 less the $2.00 NPV) is only $1.00 per square foot, and the immediate benefit replacement is $0.83 (per sqft) annual savings, the simple payback is less than 14 months. Planned replacement is almost certainly less expensive than emergency replacement. Potential incentives, tax deductions, improved reliability, and the attractiveness of lower operating costs to potential tenants, provide additional benefits to be considered. Improved maintenance can reduce the drift in effective EER, and help ensure that the expected useful life of equipment is met. In this example, the expected NPV of repair/replacement costs for a well maintained, (year 8, green table) 8 year old unit (ie. expected to reach 15 years), is approximately 50 percent less than the same unit (year 8, red table), poorly maintained. It’s simple math, based on more frequent replacement, and standard preventative maintenance costs. Every building and every RTU is unique by location, use and heating/cooling load. Each is a significant asset to the building, with its efficiency determined by its age, specification, condition, and service. Lack of this information is the biggest barrier to improved management of RTUs. An energy audit has been the traditional approach to assessing this equipment, but specialized expertise and processes are generally necessary to conduct an audit and inventory the equipment. The cost of this data collection may be uneconomic, especially if properties are geographically distributed. The service contractors that maintain the equipment also have the expertise to assess and provide the asset and service data (as part of their normal service practices), which can eliminate the need for an audit. This requires a centralized, collaborative service management platform that includes these contractors, to capture operations and maintenance activities in real-time. BuiltSpace has created this platform, giving building owners and their service contractors, streamlined management of equipment service, each with their own managed building portfolio. Actively measuring and managing the maintenance and energy performance of your HVAC equipment can pay huge dividends. For more information please feel free to contact me at rick@builtspace.com. This has been one of my most popular posts. BuiltSpace is working with selected building owners and their mechanical service partners to implement active RTU Management plans across their asset portfolios. For a free assessment of potential savings within your RTU portfolio, please contact me at rick@builtspace.com.